Two of President Hoover's closest kin are President Franklin Pierce and his wife Jane (Appleton) Pierce. Other presidential kin include, but are not limited to, James Garfield, Millard Fillmore, Chester Arthur, Grover Cleveland, George W. Bush, Gerald Ford, and William Howard Taft. He has royal connections that include two of King Henry VIII's wives, Anne Boleyn and Jane Seymour, and a connection to the current royal family through Princess Diana and her son Prince William. 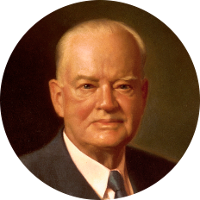 President Hoover has a number of kin who served the Patriot cause during the American Revolution. This includes at least two signers of the U.S. Constitution, John Langdon and Nicholas Gilman, and two signers of the Declaration of Independence, Roger Sherman and Robert Treat Paine, and a Boston Tea Party participant, Samuel Howard. Other more contemporary famous kin include actors Mark Wahlberg, Kate Upton, Richard Gere, Matt Damon and Ben Affleck.